Mohammed al-Hathri, a secretary and educational chief in Saudi Arabia was fired after Star Wars character Yoda was spotted in a text book next to a Saudi King. In most places, Yoda showing up in a textbook wouldn't be such a bad thing, but it ended up costing al-Hathri his job after students noticed the clearly Photoshopped image. Education minister Ahmed al-Eissa has described the incident as an unintended mistake while also announcing that new versions of the textbook were already being produced to fix the Jedi Master error. The Sun U.K. reports that the doctored image, created by Saudi artist Abdullah Al Shehri, more popularly known as Shaweesh, depicts the late King Faisal, who was foreign minister at the time, signing the United Nations Charter in 1945 with the tiny green Jedi Master seated to his right. 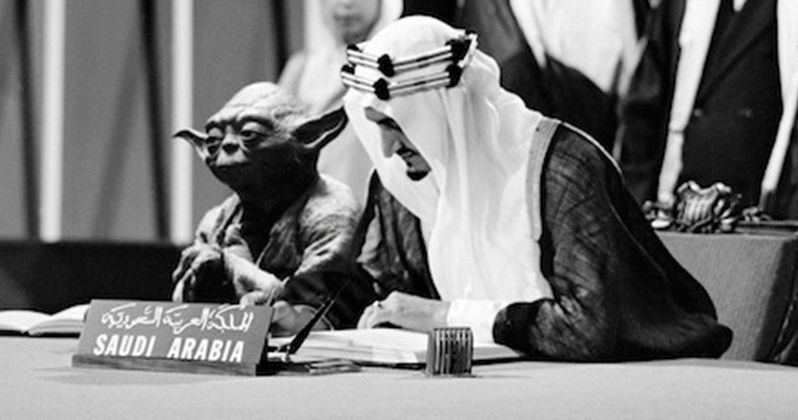 Shaweesh said that the image is a part of a montage in tribute to King Faisal and Yoda. The artist said that he holds both King Faisal and Yoda in "equally high esteem", but he has absolutely no idea how it ended up in the text book and that he "definitely did not mean to cause offense to the royal family". Regardless of Shaweesh's intentions and even though he didn't place the image in the book, the picture of Yoda giving approval still got al-Hathri fired. Shaweesh was just showing his appreciation of Hollywood movies and his appreciation of Arab history and combining them and the artist says that whomever was in charge of picking the images for the social studies textbook should have done a better job in the editing process. In Shaweesh's original piece of art, Darth Vader is also standing behind Lawrence of Arabia and the Iraqui King at the Paris Peace Convention in 1919. Though Yoda and Star Wars are very popular in Saudi Arabia, Yoda is even the same color as the Saudi flag, the education ministry had no choice but to fire al-Hathri for not doing a thorough enough job while searching for images that had to do with the United Nations in the social studies textbook. To try and fix the situation further, Shaweesh went on to share his love for Yoda and the former King by saying, "He was wise and was always strong in his speeches, so I found that Yoda was the closest character to the king." In addition, for those keeping score, Yoda's lightsaber is also green. The image of Yoda is pretty striking and it leads one to wonder just how Mohammed al-Hathri let the little green Jedi Master slip into the textbook. It could be a complete accident, an oversight, but it could also be a blatant tribute to one of the greatest Star Wars characters ever while also giving the Saudi King an amazing compliment. We'll probably never learn the truth behind the image, but while it's being investigated, check out the pretty amazing photo of Yoda and King Faisal signing the United Nations Charter in San Francisco below.